44 (or maybe more!) Ways to Celebrate Children's Poetry! Purchase using the links above and any referral fees are donated to Kickstarter & Donors Choose. Thank you for helping to support these terrific causes. Fold this dog! Write your poem inside. Little Dog is hosting a SLEEPOVER! 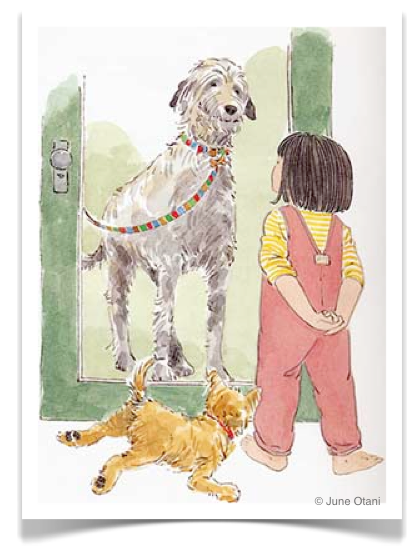 The endearing characters from LITTLE DOG POEMS are back—and this time the little girl and her little dog have a very large overnight visitor. Even though Duncan and Little Dog are very different, they have lots in common, too—both love cookies and scratches and mud and mischief. Twenty-seven short, playful poems, narrated by the little girl and illustrated with delicate watercolors, affectionately observe the contrasting canines and are an appealing introduction to poetry for very young readers. 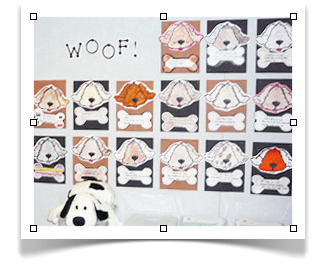 When I read Little Dog Poems and Little Dog and Duncan to students, hands fly up around the room. Children can't wait to share stories of their pets and this enthusiasm makes a wonderful prompt for students to start writing their own poems about their own pets. I discovered that it helps students "focus" their poems if they imagine taking a snapshot of their pet. (We act like movie directors and "frame" the shot using our fingers.) Students then choose one "scene" starring their pet. Since these poems (which are haiku-like) don't rhyme, students are free to develop their ideas without going off in a different direction trying to make a rhyme "fit." Students feel successful because - without the constraints of rhyming - they are can express their original ideas and images. Another warm-up was suggested to me by Francess Burch who teaches in Redlands, CA. Francess read Little Dog Poems to her students without showing them the illustrations. She then invited them to draw illustrations to match the poems they had just heard. This was a wonderful way to demonstrate to students how the words of a poem creates images in our minds. MUSIC: I've also had fun using music for a "warm-up" to a reading, or to set the mood for a poetry writing workshop. A favorite is "Linus & Lucy" from George Winston's Linus and Lucy: The Music of Vince Guaraldi. If you've used Little Dog Poems or Little Dog and Duncan in your classroom and have an idea or suggestion to share, let me know! The idea for Little Dog and Duncan arrived one afternoon when our neighbor's Labrador Retriever mix, Mocha, bounded through the front door. It was a simple recipe: Take one calm household with one small dog. Add one BIG dog. Mix together and you get...chaos, mischief, and lots of fun! 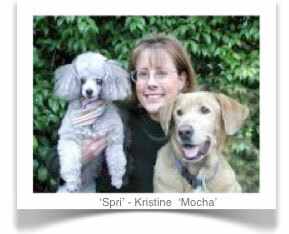 Even though she weighed 70 + pounds, Mocha did not intimidate our little dog, Spri, in the least. As a matter of fact, Spri wasted no time letting Mocha know who is "boss" at her house. In watching Spri and Mocha play together—and test each other's boundaries—I found myself thinking about friendship and that special, trusting moment when a child or dog truly feels "at home" in a friend's house. June Otani did a great deal of research for this book; she even attended the Westminister Dog Show to study the various breeds. The character she finally chose for "Duncan" is based on the champion Irish Wolfhounds she studied and sketched. I laughed when I saw the opening spread of Duncan at the front door. What a terrific dog! I hope you enjoy reading about Little Dog's adventures. Perhaps it will inspire you to invite a canine friend over for tea or to spend the night! Starred review, School Library Journal "George has a real knack for choosing ordinary moments and describing them in accessible yet lyrical language, transforming the mundane into the magical. The poems have been pared down and polished to perfection; although written in free verse, they have the elegance and quiet eloquence of haiku. Otani's watercolor paintings are filled with personality and charm. The use of white space or very understated backgrounds keeps the focus on the interaction between the characters, whose expressions and body language echo the emotional nuances of each selection. Glowing with warmth and gentle humor, this book makes a great choice for reading aloud, or for quiet sharing while children are snuggled up with their favorite pet or stuffed pooch." Starred Review Horn Book Magazine "...harmoniously designed for both sense and for interplay with Otani's beguilingly casual watercolor sketches of the two dogs and the little-girl narrator/poet." "My English teacher used to tell me that a real poet uses the smallest number of words to say the biggest things. In which case, Kristine O'Connell George is the master. 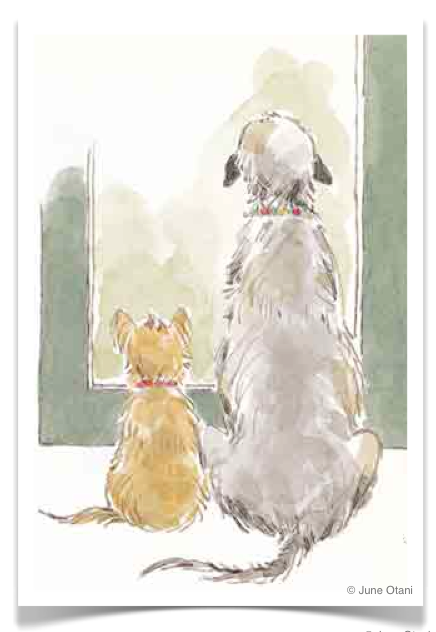 The quiet brilliance of Little Dog Poems is followed up this season with Little Dog and Duncan, in which a large and lolloping new friend is welcomed for an overnight stay. 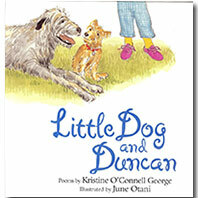 "Duncan is a digger./ Little Dog is a digger./ That's how they met/ mud." Besides being a tender and observant ode to canine life, O'Connell's natural, almost conversational free verse surreptitiously shows children what a poem can be. The unpretentious paintings are as well suited to the text as Duncan is to Little Dog, complimenting the poems without upstaging them. Both Little Dog books ring with a big gladness for little things." Kristine O'Connell George. All rights reserved. Poems, excerpts, audio, video, text, and art images on this site are copyrighted and used with the permission of their creators. Please respect their rights! Content may NOT be re-posted or re-used electronically or in print without permission. Contact author to request permission for reposting and reprint rights.